This is the 5th Year In Review episode for this podcast! Time flies when you're having fun. 2012 was the first full year of the New 52 DC Universe. This episode will highlight the story lines of first ACTION COMICS then SUPERMAN, beginning with issues 5 through 15 for ACTION, and issue 14 for SUPERMAN, including the 0 issue and both Annuals. (SUPERBOY and SUPERGIRL will not be covered, since I did not subscribe to either title only because of budgetary reasons.) Then I will give my review of both titles and pick my favorite title for 2012. Coming up in 2013 will be my annual coverage of MegaCon, and for the first time ever I will attend the Superman Celebration! Future episodes will also feature this festival. Next episode, beginning the podcast's 6th year: SUPERMAN FAMILY COMIC BOOK COVER DATED NOVEMBER/DECEMBER 1958: SUPERMAN'S GIRL FRIEND LOIS LANE 5! In 2 Weeks: SUPERMAN COMIC BOOKS COVER DATED OCTOBER 1961: SUPERMAN 148 & ACTION COMICS 281! I also briefly discuss my Christmas holiday. May everyone have a safe and HAPPY NEW YEAR! Episode #252: Superman Comic Book Cover Dated September 1961: Action Comics #280! ACTION COMICS 280, September 1961, was published around July 27, 1961. It contained 32 pages for the cover price of a dime. Mort Weisinger was the editor, and the cover was pencilled by Curt Swan and inked by Stan Kaye, who were the art team for the Superman story in this issue. - BRAINIAC'S SUPER REVENGE (13 pgs. ), was written by Jerry Siegel, and was reprinted in SHOWCASE PRESENTS: SUPERMAN vol. III, continuing the story published in ACTION COMICS 275 (covered in Episode 240. This story was Siegel's 32nd silver age Superman story, and his 81st overall for this era. Previously he wrote JIMMY OLSEN'S KOOKIE SCOOPS for ADVENTURE COMICS 287, August 1961, which was pencilled by John Forte and inked by George Klein. Siegel also wrote SUPERBOY'S CIVIL WAR TIME TRIP for SUPERBOY 91, September 1961, which was drawn by George Papp. - The 12 page Supergirl story was titled TRAPPED IN KANDOR, also written by Jerry Siegel and drawn by Jim Mooney. This story was reprinted in SUPERGIRL ARCHIVES vol. II and SHOWCASE PRESENTS: SUPERGIRL vol. I. It was Siegel's 50th silver age Superman Family story and his 82nd overall in this era. This story is the third part of a Supergirl saga that began in ACTION COMICS 278 and was continued in issue 279. A caption in the story's final panel stated that the story would conclude in the next issue. 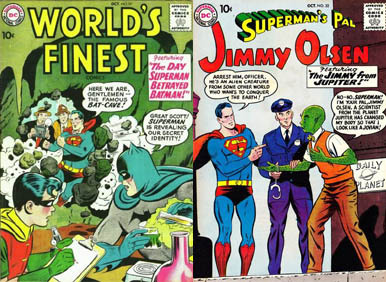 Elsewhere in DC Comics, 28 titles carried the September or September/October 1961 cover date, according to MIKE'S AMAZING WORLD OF DC COMICS. Also highlighted in this episode are the issue's ads and other features, including the METROPOLIS MAILBAG! Next Episode: SUPERMAN 2012: YEAR IN REVIEW! In 2 weeks, for the first episode in 2013: SUPERMAN FAMILY COMIC BOOKS COVER DATED NOVEMBER 1958: SUPERMAN'S GIRL FRIEND LOIS LANE 5! May all of you have a fun and safe MERRY CHRISTMAS, HAPPY HOLIDAYS and HAPPY NEW YEAR! 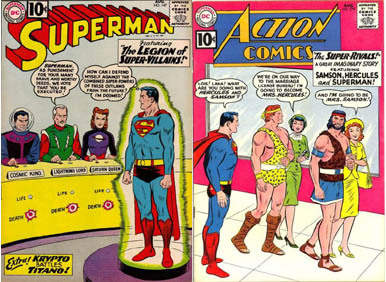 Episode #250: Superman Comic Books Cover Dated August 1961: Superman #147 & Action Comics #279! Superman #147 & Action Comics #279! SUPERMAN 147, August 1961, was published on June 13, 1961. It contained 32 pages for the cover price of 10¢. Mort Weisinger was the editor, and the cover was pencilled by Curt Swan and inked by Stan Kaye. It recreated the classic cover of ADVENTURE COMICS 247, which introduced the Legion Of Super-Heroes. All three stories have been reprinted in SHOWCASE PRESENTS: SUPERMAN vol. III. - THE GREAT MENTO (7 pgs. ), was written by Robert Bernstein and drawn by Al Plastino. - KRYPTO BATTLES TITANO (8 pgs. ), was written by Jerry Siegel and drawn by Al Plastino. This was Siegel's 35th silver age Superman Family story, and his 75th overall for this era. 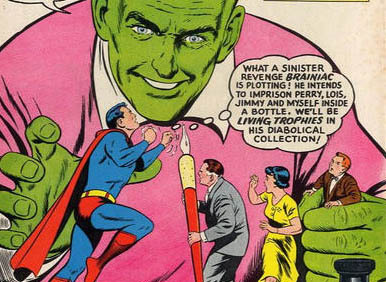 He also wrote BIZARRO, PRIVATE DETECTIVE for ADVENTURE COMICS 286, July 1961, drawn by John Forte. - THE LEGION OF SUPER-VILLAINS (11 pgs. ), was written by Jerry Siegel, pencilled by Curt Swan and inked by Sheldon Moldoff. This story was Siegel's 36th silver age Superman story, and his 76th overall for this era. Not only did this story introduce the Legion Of Super-Villains, but the Adult Legion Of Super-Heroes as well. It was also reprinted in SUPERBOY 147, May/June 1968, published on May 14, 1968, which itself was reprinted in a replica edition released on January 2, 2003. This story was also reprinted in LEGION OF SUPER-HEROES ARCHIVE vol. I and SHOWCASE PRESENTS: LEGION OF SUPER-HEROES vol. I. ACTION COMICS 279, August 1961, was published on June 29, 1961. It contained 32 pages for the cover price of a dime. Mort Weisinger was the editor, and the cover was pencilled by Curt Swan and inked by Stan Kaye, sporting a bright pink cover.ACTION COMICS 279, August 1961, was published on June 29, 1961. It contained 32 pages for the cover price of a dime. Mort Weisinger was the editor, and the cover was pencilled by Curt Swan and inked by Stan Kaye, sporting a bright pink cover. - The 13 page Superman story was titled THE SUPER RIVALS. MIKE'S AMAZING WORLD OF DC COMICS website at dcindexes.com does not list a writer, but THE GRAND COMIC BOOK DATABASE at comics.org lists the writer as possibly being Robert Bernstein. Both websites agree on the artist, John Forte.- The 13 page Superman story was titled THE SUPER RIVALS. MIKE'S AMAZING WORLD OF DC COMICS website at dcindexes.com does not list a writer, but THE GRAND COMIC BOOK DATABASE at comics.org lists the writer as possibly being Robert Bernstein. Both websites agree on the artist, John Forte. - Supergirl starred in the 12 page story titled, SUPERGIRL'S SECRET ENEMY, written by Jerry Siegel and drawn by Jim Mooney. This story was Siegel's 37th silver age Superman Family story, and his 77th overall for this era. it continued the story begun in ACTION COMICS 278, covered in Episode 246. Elsewhere in DC Comics, 31 stories carried the August or August/September 1961 cover date, according to Mike's Amazing World Of DC Comics. Next Episode: SUPERMAN FAMILY COMIC BOOKS COVER DATED OCTOBER 1958: SUPERMAN'S PAL JIMMY OLSEN 32 & WORLD'S FINEST COMICS 97! In 2 Weeks: SUPERMAN COMIC BOOK COVER DATED SEPTEMBER 1961: ACTION COMICS 280!